Faculty advisers guide students and their parents at Academic Advising and Registration. 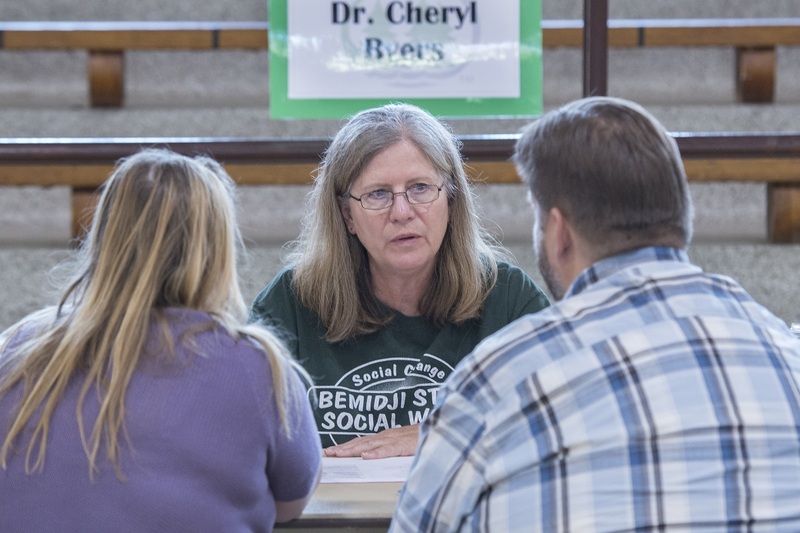 Bemidji State University is intensely focused on the success of its students, and several types of advising and support are available to help make sure they graduate and continue on into successful careers. That includes you. Advising can take several forms and will come from several different places throughout your academic career. Advice on how to identify and seek internships is important for most students. resources to utilize and other steps that will help you be successful. Not only do we have several helpful, highly trained and expert professionals on our staff, but we also recruit and train student peer advisors who can share their own experiences at BSU. One of the most basic and important types of advising you will experience at BSU is academic advising. All degree-seeking students are automatically assigned a faculty adviser. If you have not declared a major, you will be assigned to your First-Year Experience (FYE) instructor or to an advisor-at-large who will assist you in an advising capacity until you have selected a major. Once you declare a major, you will be assigned to a faculty member within that program. Academic advisors are there to guide and counsel you, but it is your responsibility to make final decisions. They can help you stay on track toward graduation and make recommendations for course selection and career preparation. The Advising Success Center, which like Career Services is located in Decker Hall, not only coordinates the academic advising process, but is an important resource center in its own right. They are here to help you from the day you arrive on campus to the day you graduate, offering such services as peer tutoring, tutoring referrals and counseling regarding academic progress. Think of us them as your personal advocate, helping you to navigate your way through your college career. Wherever your path may lead you, the Academic Success Center is ready to help you identify opportunities, maximize your potential and achieve your goals.